Last night, when Michael went out just after dark to shut the chicken coop, he found our Dominique hen, Patsy, dead in the nesting box. We have no idea what happened. Earlier in the day she seemed fine. Michael and I worked in the garden in the afternoon and she was out and about as usual. Needless to say, we were all quite sad last night. Circle of life and all....we get it...but this is our first experience of losing a chicken friend. Dominiques are quite striking in appearance....their feathers are black and white and are irregularly striped or "barred." They have a red comb. They are calm and personable. This is my favorite photo of Patsy, the Dominique hen. Our Patsy was a good layer and we easily recognized her egg. She laid the smallest egg of the bunch and hers were the nearest to pink in color. When she began laying, I was quite concerned for her because the shells of her eggs were thinner and more brittle than the others and they were rough in texture, like sandpaper. But, time went by and she seemed healthy and happy, so I quit worrying, mostly. 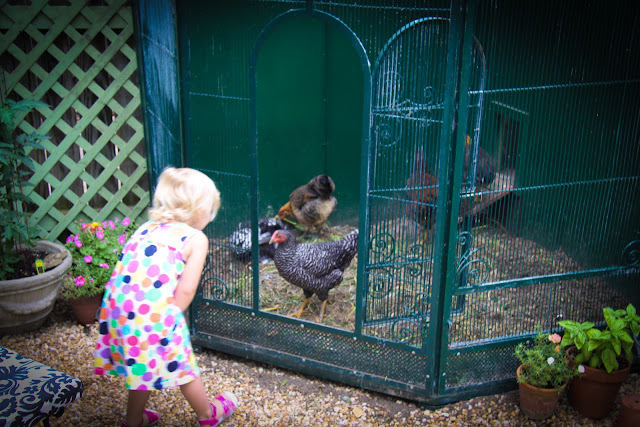 We weren't really sure what to expect when we began our chicken keeping experience. 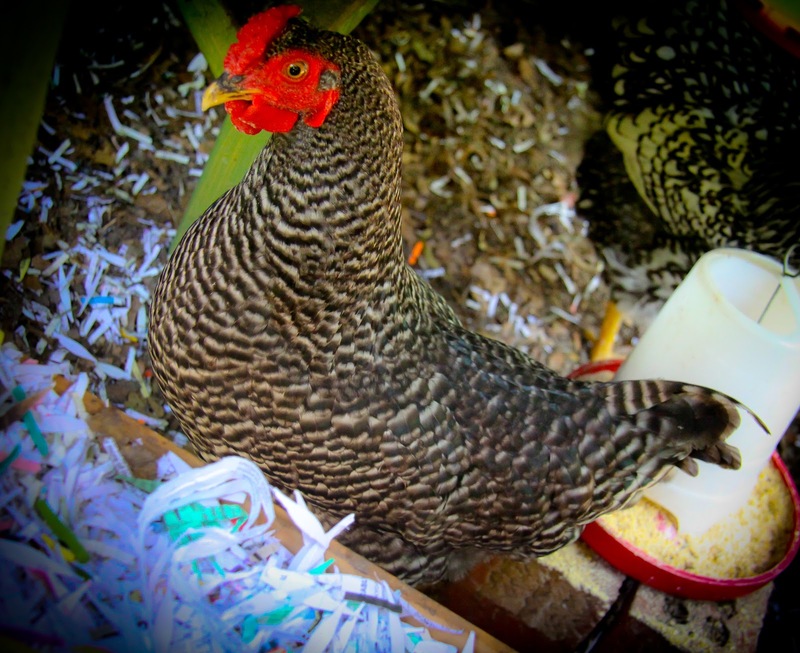 The work has been minimal, thanks to the deep litter method of hen house keeping. (Here's a link to a short, informative article on the deep litter method.) 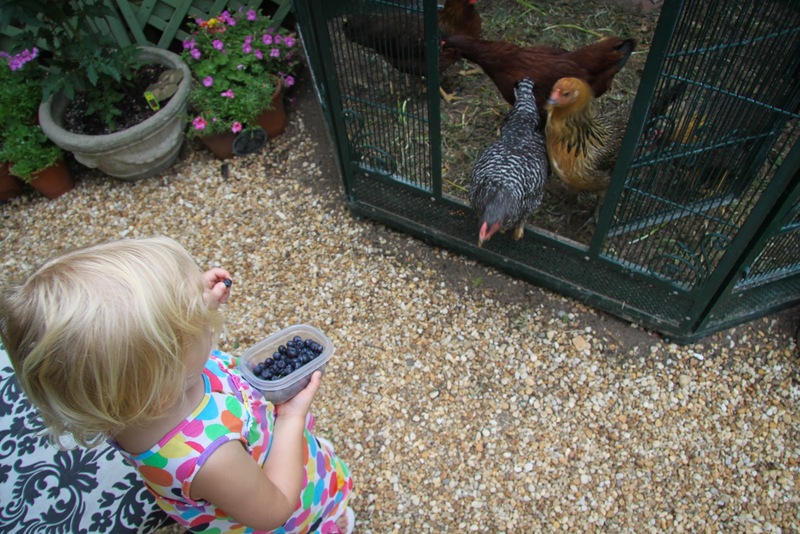 I had no idea the chickens would be so entertaining or how much I would enjoy hearing them cluck to one another. I had no idea the sense of life and energy they would bring to my garden. But what I was most completely unprepared for was the level of responsibility I feel for their well being. It has at times made me quite anxious. I've sat with this, asking myself why I feel more anxiety and fear for my hens than I do for my dog and my cats. I think it's because hens are so completely vulnerable. Chickens have many predators to worry about.....racoons, foxes, hawks, dogs....and bless their hearts, they have no claws or teeth to use to defend themselves. They can barely fly and while they are quite speedy when you are trying to catch them, they aren't speedy like a cat or a rabbit. They can't see well in the dark so a night attack could result in the demise of an entire hen house! More than once I have woken in the night, sat straight up in bed and shrieked loudly, worried that we forgot to secure the coop. I am grateful that by all appearances, Patsy died peacefully. Patsy may or may not be in these photos taken when we went to visit our friend's chicks....we received six chickens from this group of chicks. Last night, after I told little c that Patsy had died, she drew this photo and penned this little obituary. June Carter is actually c's proclaimed "favorite hen" but maybe that made c feel a little guilty for having a favorite...who knows? Like little c, I am glad we have "pichers of her" to help us remember our friend, the little Dominique hen, Patsy Cline. She was a good girl. We will miss her.